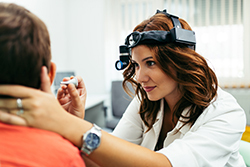 The first step in diagnosing hearing loss is to perform a hearing evaluation in order to create a baseline. The audiology team assesses all the different parts of the hearing mechanism. “We look at the mechanical part of hearing, the different neurologic systems, and then the acuity of how someone is able to hear and even how clearly they are able to hear and understand speech,” explains Dr. Touchette. If the ears are found to be otherwise healthy, and if there’s nothing that can be done medically to help the patient hear better, hearing aids enter the conversation. Other devices such as specialized telephones or TV listening devices may also be considered. Modern-day hearing aids are able to fit a patient’s hearing prescription very precisely and can even distinguish between speech patterns and certain types of noise. For example, settings can be changed based on varying environments (e.g. in the living room watching television versus a baseball game or noisy restaurant). Another benefit is that they’re rechargeable, offering convenience and ease for individuals who encounter dexterity challenges. Some of the newest hearing aids can connect to smartphones and other devices via Bluetooth wireless technology. “You can now talk on your phone through your hearing aids or even listen to your TV,” reveals Dr. Touchette. Just as capabilities have improved for hearing aids, implantable technology has also seen advancements. The transducers that transmit sounds for cochlear implants and bone anchored hearing aids is also now fully digital, with all of the similar noise reduction capabilities and Bluetooth capabilities of modern hearing aids.